For the last 35 years, we have been researching, how in practise on farms and in theory, to help, rural women in Africa have a life of quality but increase or retain their political independence , and ,at the same time , how to integrate, wildlife conservation, with food production. We have developed and run 4 successful farms in UK, and helped many start in Kenya, Malawi, Uganda and Zimbabwe, developing one in France and one in Africa. Proposed Eco Farm Demonstration, Educational & Research Centre in Africa. Even though Africa is a very large continent, land is increasingly becoming a limited resource and conflicts of interest for land use are growing. One of the most important is that between those who wish to preserve large areas of land for wildlife conservation, and those who wish to have more land for growing of food and other agricultural products. The majority of the local rurally based voting populations in the different countries usually favour more land for food production since wildlife is often a nuisance from which they receive no benefits. Various ideas to help towards resolving this conflict have been tried. In general they have been geared towards trying to bringing the local rural people more into the consumer economy by sharing money earned from the wildlife (by tourism or hunting) with the local communities. There is a strong trans-African cultural interest among women in growing food for their families . As a result, women in many areas of the developing world , (where paid work is often scarce, available land in short supply, and no welfare payments have a growing sense of insecurity. There is unlikely to be one solution to this conflict throughout Africa, but there is a very important need for new ideas which may be relevant. Failing further integration of food production and wildlife conservation, ,much of the indigenous fauna and flora, (particularly the large animals) will be extinct in a few years, and/or wildlife areas will be very restricted. The Eco Research & Educational Centre has been working on local practical solutions to this conflict by developing and running self-sustaining small farms which, because they require little capital and are economically viable, can help increase the rural womens’ options. For the last 30 years we have been acquiring appropriate techniques, integrating modern scientific knowledge with local community knowledge and skills (further information in Ecological Agriculture, Food First Farming 1993, Souvenir Press, London), and teaching others from all over the world to do this (150 to date). Such farms can on a small scale produce more for less than modern conventional agricultural production, and re-empower women to provide food for their families. A diploma course has been run at the Eco Research Centre for the last 15 years, to which scholarships have been given to people from all over the world including Kenya, Uganda & Zimbabwe and follow up assistance to help them set up and run demonstration small farms in their countries. One of the major emphases has been to integrate domestic animals into farms without causing them to suffer. We have conducted experiments with different management systems and developed highly profitable non-intensive, self-sustaining small scale animal husbandry systems for domestic animals where they have lives of quality (Kiley-Worthington & Randle 1999). One of the major problems areas at present are areas of small farms that abut national parks or nature reserves. The large mammals often escape and cause havoc to the local farmers and their crops, reinforcing the local populations desire to be rid of them and have the land. These animals can be contained, and, also, some of them can be handled and taught to do useful work efficiently and safely for the local community on their farms or transport heavy materials. In this way they contribute to the local poor rural communities with energy ( e.g. elephant, zebra, buffalo) and also by providing other products which do not threaten their lives, such as milk (e.g.eland and cape buffalo) and fibres. 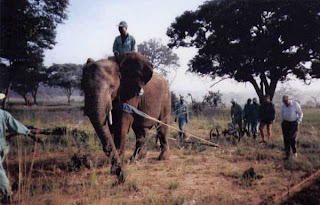 The local people then have experiences with these animals which are of great help to them ( an elephant can pull a two furrow plough and plough around 1h a day, compared to a bullock 0.25h/day). The people then begin to value them for their work, and finally, for themselves (that is their intrinsic value). They appreciate them as living emotional beings and part of their traditional invaluable cultural heritage. So, these traditionally wild animals become ambassadors for wild life, and not just something to attract tourists from whom the small farmer rarely benefits. Aims of the Eco Research & Education Centre in Africa. (3) Interest the local community in their natural heritage living with large wild animals by teaching some of them to do useful things for the people. The ecological farm will provide food and fodder for the resident humans and animals, building materials and furniture (for accommodation for people and animals, lecture rooms and laboratories). Local traditional building styles will be the basis for the design. The farm will provide its own energy from renewable resources using simple available cheap technology (wood, wind, sun, water if available, and animal and human power). Its own water ( rain water collection and storage, irrigation, recyling water systems) and waste disposal (recycling organic and other wastes, e.g. compost, and making simple objects from recycling plastic). It will grow staple food crops such as wheat and maize, and vegetables, dairy, eggs and some meat. It will develop small cottage industries reliant on the raw materials from the farm. These will include wood workers ( e.g. wood carving, turning, making furniture from the farms self-sustaining woodland), spinning and weaving from the wool and fibre from the farms animals, basket making from appropriate bush and the farms sisal ( if appropriate), diary products from the farms milk ( e.g. cheeses, yogurts, cream, butter), and pottery if clay is available. The medicinal use of indigenous plants will be studied, collected and processed. The first objective is to supply the residents on the farm, if there is excess the products will be sold locally. The ecological farm and wildlife area will be an educational centre. The courses offered will be principally for local people, but attendants from the developed world will be welcomed and charged to finance local participants. We will continue teaching the 6 month certificated, and one year diploma courses in the theory and practise of ecological agriculture, already internationally renowned. and running for 15 years. Courses will be run on the behaviour, ecology and husbandry of wild animals, ecology, conservation, environmental philosophy. 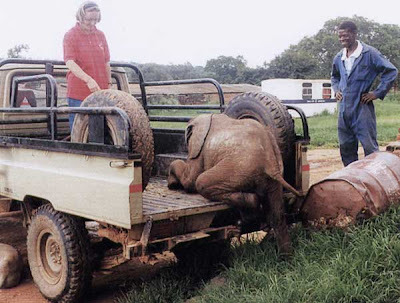 With certificated qualifications for large animal handlers which concentrate on ensuring human safety, cooperative teaching and a high quality of life for the anim als (developed for elephants in Zimbabwe a world first). Short courses 1-14 days will also be run. 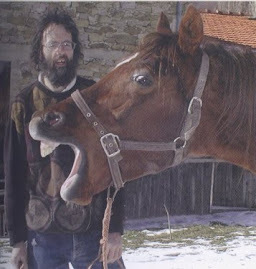 Research of all levels will continue in ecological agriculture, ecology, animal welfare, large mammal cognition, equine minds, environmental philosophy and animal educational psychological. International researchers will be encouraged and the centres research staff will continue to produce publications. The centre will be to accommodation, supervision and research facilities. In exchange, they will be asked to contribute to the centre ( e.g. help with teaching,or researching ecological problems that arise at the centre or in the locality). A particularly attractive unique aspect will be the experience of living with the animals, and learning more about them instead of just seeing them at a distance. All the people will live together at the centre, in order to foster international understanding and cooperation. Over a period of time, local people will be trained to administer and run the centre. Situation. The area for the establishment of this centre is under discussion. It is essential that the project fits with government aims and has government cooperation and it must be enthusiastically welcomed by the local people. We are therefore sending this proposal out to individuals and governments whom we consider might be interested. (3) Wildlife conservation & research. In many countries in Europe, USA, Australia, New Zealand and Africa. (e.g: Kenya, Malawi, South Africa, Tanzania, Uganda, Zambia, Zimbabwe). There will also be undergraduate and post-graduate students involved. Finance & Budgets. Finance, energy and expertise is available for developing the centre from scratch once the land is available, although more finance will increase the speed of development. The project is in memory of one of the founders of IUCN and of Human Ecology (Dr. E.B.Worthington) & Stella Johnson, Kenyan dairy farmer. The project must be backed by both central and local government approval and have the donation of land, (or some leasing arrangement) before it can go ahead. Further finance as the project progresses will be necessary, in particular to reintroduce some of the traditionally wild animals and establish small breeding herds. There is considerable interest in this proposal from organisations and individuals internationally, including the media, consequently there should be good media coverage. The idea is to match the existing finance by funds raised. This project is, in part, a model for how poorer rural people who have some land could farm and integrate wildlife conservation . It will develop at the appropriate rate for the local community using local resources, although, initially, there will be a need for some financial inputs for the development of the educational and research programme. It will apply for charitable status once the site has been selected.